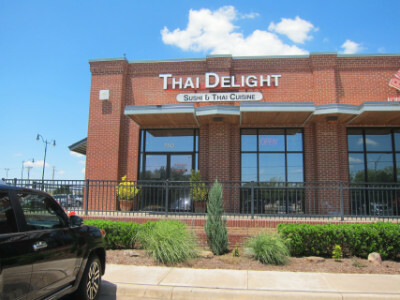 I had lunch at several Thai restaurants this summer (2016), and I really thought the one at Thai Delight was the best. This in itself is quite a feat, since Thai food ranks high among my favorite cuisines. As a whole this was quite a good list of restaurants, and in general I recommend seeking out the Thai lunch specials that are available. Admittedly having one meal does not provide a good basis for proclaiming this to be a good restaurant overall, but it is a good beginning. I can say with certainty that they have at least one very good dish. Thai Delight has a much larger sushi menu than Thai, and I am not sure why they are doing both cuisines. In addition they have Japanese box lunches and other Japanese dishes such as udon. 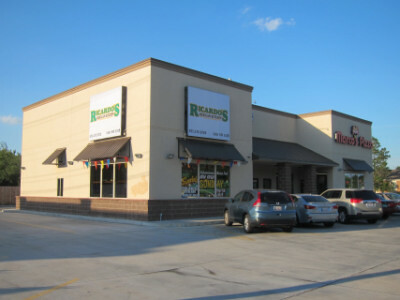 The restaurant is located in a shopping complex at the southwest corner of 33rd St. and Broadway in Edmond. I would call the complex upscale, but for some reason they have raised the level of all the stores up a half flight of stairs. I tried to find a wheelchair ramp, and went to the back of the building, but I did not find anything that connected with the parking lot and would allow people to get to the restaurants. I am still uncertain whether it is accessible or not, but I can say that there is not anything obvious from the front of the building. Pho Bulous Restaurant is next door, and both are visible from Broadway. There is an entrance to the parking lot from 33rd Street. Fresh Ginger was one of the options on the lunch menu, but was something I wanted to try and would have ordered anyway even if I had to get it from the dinner choices. Overall the restaurant has a better selection of lunch choices than most of the other Thai restaurants I visited. It is not so much that they have a lot of choices, but they have the ones that I consider to be the better choices available in Thai restaurants. The outstanding features of the fresh ginger were a vibrant flavor and the fact that it was not too sweet. Some other restaurants in OKC do have good versions of this dish, but I had such a good experience at Thai Delight that this has to be near the top of the list. I ordered it with tofu (which I thought was excellent). One thing I liked was the ration of tofu they had to other things that I consider to be “filler” (onion, bell pepper, etc.). The sauce was quite good as well, and contributed greatly to the overall enjoyment of the dish. The Salad was also very good, but even better because it was free. The dressing had a good flavor and the salad was fresh. A spring roll also came with the lunch special (and this was one of the better spring rolls I have had). I tend to put Thai tea into one of two categories–ones I like and ones that are disappointing. The one here was the former, so I was happy. 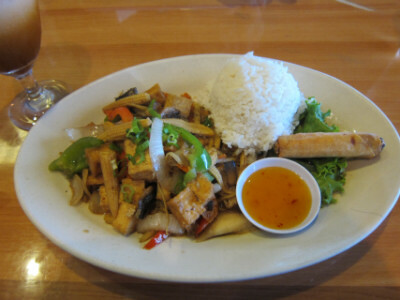 Thai Delight has 17 lunch specials for $7.95, and there is a wide choice of items including basil, curry, cashew, ginger, eggplant, broccoli, and pad thai (each has a choice of chicken, beef, pork, tofu, or veggie). There are also a couple of chicken dishes. The restaurant also has fish dishes for $8.95 and duck choices for $11.95. Overall this is a good selection of items for lunch. Japanese box lunch and sushi specials are also available for lunch. The Thai menu is not quite as much of a bargain for dinner, but they do have quite a good selection of items. These include additional types of curry not available at lunch such as Panang, Massaman, and pineapple. The bulk of the dinner menu seems to be sushi, but it is mostly rolls with a small selection of a la carte sushi/sashimi. There are also Japanese dinners such as tempura, kutsu, and teriyaki. I do not know if the restaurant is completely free of MSG, but my meal did not have any. The dining room was very large and comfortable compared to several others in my sample list of restaurants (this is not a big deal but it might be important for some people to know). The service was very good, as it seems to be in all the Thai restaurants. The difference here, though, is that they had more waiters, so I think you get somewhat faster service. As I mentioned, I had an issue with the handicapped parking. This is something that was created by the shopping center designer, though, and maybe there is some sort of “secret entrance” that I did not discover. The fresh ginger was so good that I am giving the restaurant a rating that I rarely do based on a single dish. This dish, though, is one of my yardsticks for judging Thai food, so I have a good amount of confidence that other food here will be good as well. I don’t know anything about the sushi here, except to say that they have quite a large variety of it. Update Sep. 2016: Ricardo’s was one of the shortest lived restaurants I have ever seen, but it now has a new owner and is called Gloria Mexican Kitchen (Gloria has the same phone number as Ricardo’s). The gentleman who was the cook at Ricardo’s is still the cook, and is one of the owners of the new restaurant. They told me the food was the same, and from my sampling I think it might be even better. The menu has changed, and they will no longer be offering Oaxacan style dishes. There are now fewer choices on the menu, but the items that were there before are still being offered at the same price. The bottom line is that this is still one of the best places in OKC to come for Mexican food. The complexity of Mexican food makes it one of the most interesting to explore, but also one of the hardest to categorize. In Mexico, restaurants are divided somewhat along the line of “alta cocina” versus “street food,” with a somewhat limited third category in the middle that would correspond to our “family restaurants” with moderate prices. In Mexico there is also a separate cuisine for each state, although many individual dishes tend to be regional or even national. It is much the same as food being very similar in Oklahoma as in the adjoining states, with marked differences being found in specific items such as barbecue. Ricardo’s Mexican Kitchen is a new restaurant in Warr Acres, and although it joins a long list of Mexican restaurants in the Oklahoma City area, this one is a little different. The owner is from Oaxaca, a Mexican state renowned for its cuisine and used by Rick Bayless as the template for much of the food served in his Chicago restaurants. The now closed Adobe Grill in Oklahoma City also served this type of food. Ricardo’s serves few of the dishes that were available at Adobe Grill, but I believe it is still in the early stages of rolling out its menu. For instance, the owner serves mole on weekends, but when I went on a Saturday with the hopes of ordering it, he said it is only available “sometimes.” I got the impression that there will be more of this type of food, though, as the restaurant picks up more customers. Although Ricardo’s is still a little short on exotic dishes from southern Mexico that are hard to pronounce, it still has very impressive food that tends very much toward upscale (“alta cocina”) cooking. At the same time, this is done with family restaurant prices (the bang for the buck is one of my biggest reasons for recommending this restaurant). Another very major reason I like Ricardo’s is the consistency of the food. Everything I have tried has been flavorful and high quality. 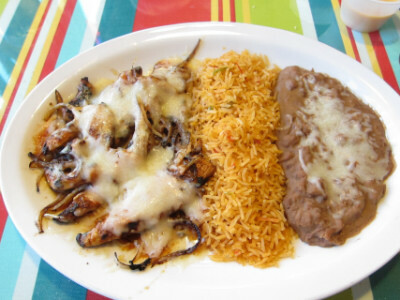 Ricardo’s holds a tenet that I think all Mexican restaurants should follow–high quality should apply as much to the chips, salsa, beans, and rice as it does to the featured main dishes on the menu. 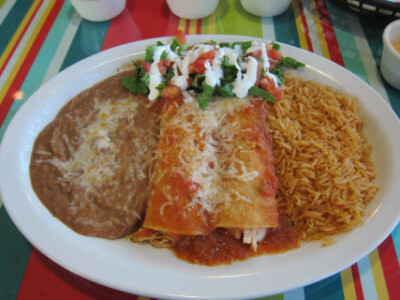 My first sampling of Ricardo’s food was with the Red Enchiladas (technically, enchiladas with ranchero sauce). There are two parts to the menu, and this is one of the items from the first part (the less expensive items that do not contain as much meat). I do not think these were actually the best enchiladas I have had in Oklahoma City. However, it was very refreshing that the only choices available are authentic Mexican style enchiladas (I think they also have ones with green sauce). It is very hard to find this type of enchilada with red sauce, and I found the ones here to be very enjoyable. The beans, rice, and salad were also the real deal, although after a couple of visits I have found the beans to be better than the rice. On the same visit I sampled an item that has turned out to be one of my favorites–the Quesadilla. This is a large tortillas with meat items and cheese, like other restaurants prepare. The one here, though, had more flavor and tasted fresher than many of the others. The Pollo Costeño was from the second portion of the menu that supposedly gives you a more substantial meal (I say “supposedly” because I think the enchiladas from the first part of the menu were just about as filling). The pollo costeño had very good chicken and real Mexican cheese. The sauce was listed as a “tomato” sauce, but I will tell readers that it was also very spicy (with about four out of five chiles on my “chile scale”). The dish had a smokey flavor that tasted very Mexican (but this was not my favorite flavor). One thing I can say about the dish is that I think it was totally authentic, and not Americanized. Once again one of my favorite dishes here turned out to be one that I only sampled, but this time I got a photo of it. 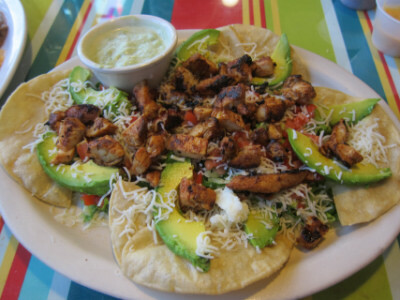 The Chicken Salad is much more than its name implies–it has large pieces of chicken with cheese and guacamole on a tortilla. The chicken was the same as on the pollo costeño, but I liked the seasoning better on this one. This dish was also a little bit spicy (as contrasted by the quesadilla, which is a good choice if you do not like things spicy). Both the chips and salsa were very noteworthy for being the type of quality that would be found in Mexico or along the border. 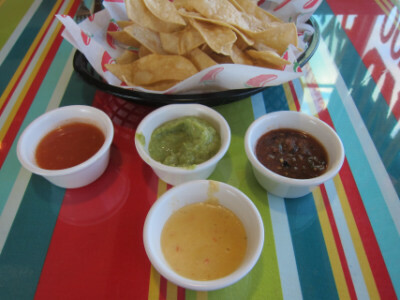 The red colored salsa and the guacamole were both spicy, while the darker one was mild (and all were good). I think the cheese sauce is an accommodation to Oklahoma tastes, and is not authentic, but it was very good as well. The chips were excellent, and I think they are prepared the way chips should be. There was conflicting information posted about the hours, but apparently they recently began closing on Wednesday evenings. It does not seem to be particularly strong on Mexican drinks, as Abel’s across the street is, but I think they do have horchata. I tried the iced tea, and it was good. Abel’s is another of my favorite Mexican restaurants, and it may be good to make some comparisons and contrasts between the two. Actually the only comparisons that come to mind are that both restaurants are very good and both pay attention to details such as the chips, salsa, rice, beans, etc. One contrast is that Abel’s specializes in food from southwestern Mexico while Ricardo’s has food from the southeast (although both seem to have dishes from all over Mexico). Abel’s is quite large with an extensive menu, while Ricardo’s is a small operation and has fewer items available. Abel’s has Americanized dishes in addition to the authentic ones. At Ricardo’s I would say they have Americanized some of the presentation of the food, but not the flavors or ingredients as Abel’s has done (for instance, Ricardo’s only uses Mexican style cheese). Ricardo’s serves street tacos, but mostly has plate dinners with rice, beans, or other extras such as salad. So far I would say Abel’s is better for street tacos simply because they have a much larger selection, but also because they have the best tacos al pastor I have found in the city. I would also say I have been more pleased with the plate dinners at Ricardo’s than at Abel’s. In short, both restaurants have different things, but both restaurants do them very well. Probably many readers are familiar with the Zomato web site, but I would like to write a few comments about this and other food related web sites. In 2015 Zomato bought Urbanspoon and included the former Urbanspoon restaurant reviews into its own web site. At the time I had come to rely on Urbanspoon as a source of information for restaurants more than any other site, and I have continued to use Zomato since then. Both of these sites have had pretty spot on reviews of restaurants with which I am familiar, and I think this is a good way to judge the validity of the other reviews on the site. I do not see that the basic reliability and honesty of the reviews have changed since Zomato took over Urbanspoon. I think Zomato has made an honest effort to publish fair reviews (all the reviews are written by diners, but Zomato has ways of screening them so that the objectivity of the opinions expressed remains fairly high). The main problem I have had with Zomato has been with the functionality of the site. Urbanspoon used to have ways of looking up restaurants in a city by cuisine or other factors that helped me find specific ethnic cuisines or other specialized restaurants. Also their method of listing the “most popular” restaurants out of hundreds in the city was usually pretty useful, although not always the way I think it should have been done (for instance, there was never more than one or two Mexican restaurants listed among the most popular places in El Paso). This is relevant to me because I started developing lists of places to try around the country, not because I thought I could eat at many of them but because I knew that at times this list would be a good resource for me, and because friends visiting other cities also wanted to have a similar list. I was shooting for having eight to ten good choices in moderately sized cities, more in larger cities, and a few especially good restaurants in smaller areas. I thought this would be a good resource to provide for readers in addition to the restaurant reviews which make up the the bulk of this site. What developed from this list is what I am presenting on this blog as the “Restaurant Guide.” These are listed for a number of states in the Southwest and West, and of course I am relying on the information I get from other sources for most of the restaurants listed. I was working my way eastward across the country in doing the preliminary research when Urbanspoon suddenly was no more, and became Zomato. The new web site still had the same reviews, but I could not find a way to query their large database to find the restaurants I wanted. This can lead to much more detailed discussions about other web sites that do provide some limited information about certain cities, and I do try to use these. But what is now missing, as far as I can tell, is a standardized way to find restaurants all around the country using what I consider to be a reliable methodology. The problem is that several web sites can provide good reviews of restaurants if you type their name into the index, but Urbanspoon was the best way to find the best restaurants out of a large list. Zomato has just been more difficult to work with than Urbanspoon used to be. This means that it will be quite difficult to expand the Restaurant Guide from the areas that are already covered. I did get some information from Urbanspoon for the Midwestern states from Kansas to Indiana, and I will try to add these when I get time. At this time, though, I do not have a good methodology for adding more states that would not be horrendously time consuming. I do want to remind readers that if you find this type of list useful, please add your own suggestions to any of these lists. I do not want these lists to become much longer, but I want them to become better (if you think there are better suggestions than the ones listed). The Restaurant Guides have a list of sources at the bottom, and nearly all include Zomato. I do want to explain, though, that in most cases Urbanspoon was the actual source of information. Of course in some cases Zomato is still a good source to get updates, verify information about restaurants and whether they are still open, and find out if the reviews are still positive. Mostly, though, I have moved to Yelp for this.